This fascinating hand colored 1815 map by Edinburgh cartographer John Thomson depicts southern Tartary, Tibet (Thibet), Mongolia, and generally the whole of Central Asia. Area covered extends from the Caspian Sea to Japan and Korea. Shows the ancient caravan routes of the Silk Road – many of which are still in use today. 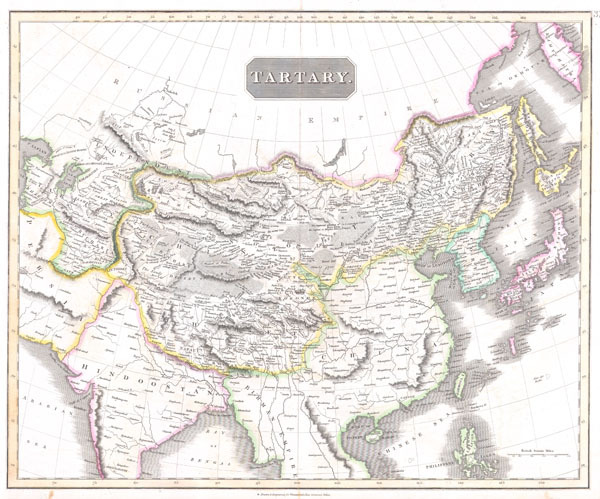 Magnificent size, beautiful color, and high detail make this one of the finest maps of these central Asian nations to appear in the early 19th century.